Coyote Tail . . . Fun, Fleas, or More? This coyote spends a lot of her time sitting and observing what’s going on, but recently she has been plagued by fleas — she’s been overwhelmed by them. Many of her behaviors reflect this: scratching them, darting away from them (as though this would help! ), running in circles after her itchy tail, curling in a little ball to be able to reach the flees on her back and her tail with her snout, and discovering that she could “roll” when she did this. You can actually see the flea bites all over her face. It must be excruciatingly uncomfortable. I’ve had a couple of flea bites and it was awful. Dogs get fleas and it drives them crazy! And why does the coyote jump up and down, bouncing a little like a pogo-stick? Coyotes do this when they get excited and when they want a better view. This coyote, judging from the direction of her gaze, has seen something on the other side of the hill which we can’t see. I would guess it’s a dog that simply caught her attention. I’ve seen this reaction to a dog in the distance many times. A dog walker suggested that, from what she knows about dog behavior, that the coyote’s behavior in this video might be anxious behavior due to the photographer because her own dog freaks out when “a lens is shoved in her face”. I took the suggestion to Turid Rugaas, who studies wildlife to know what is *natural* behavior in order to understand stressed-out dogs. She assured me that this is not what is going on here. First of all, this is not an inbred little domestic dog, it is a wild coyote. Secondly, no lens is being shoved in this coyote’s face — this video was taken well over 100 feet away. Thirdly, this coyote has her freedom to move, and would do so in order to avoid a stressful situation, unlike a dog who feels constrained by it’s owner’s *unnatural* demands: it’s this latter which causes anxiety in dogs. Fourthly, loner coyotes without families invariably become inventive in their play to fill the time that normally would be devoted to family interactions. Coyotes are social animals, so when there are no family members to interact and play with, and because they need to expend their pent-up energy, they invent all sorts of play activities for themselves. 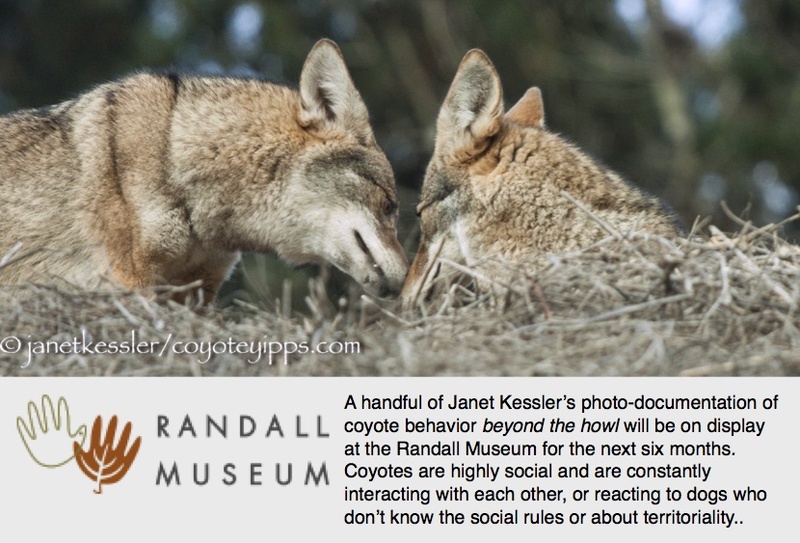 Motion reactivity is a big factor influencing coyote behavior. If you have a dog, you need to know about it. Motion reactivity is a reaction to excessive or fast motion. Coyotes are programmed to react to this kind of stimulus. It’s because of this that we tell folks not to run from a coyote. When a coyote sees something running, say a running rabbit, it is immediately put on alert and pumped with adrenalin in preparation for pursuit. It is a hunting and a defensive instinct. If your dog is actively chasing a ball, actively chasing or wrestling with another dog, or fighting with another dog, these involve fast and hyper motions. A coyote’s attention is immediately attracted to the activity. They stop what they are doing and are drawn to it. Today, we saw a classic example of this motion reactivity. A dog walker, who knew a coyote was nearby, allowed her dog to walk off-leash in the area. The dog’s attention was caught by a juvenile Red-Tail Hawk who had slammed into the grasses to grab a rodent and then hovered close to the ground for a few seconds. None of us noticed how quickly the dog ran off, excited, enthusiastic and full of unleashed energy, after the hawk. The dog’s excited dash across the field — involving hyperactive movements and speed — immediately caught the coyote’s attention. The coyote had been foraging calmly in the grassy field several hundred yards away — not at all close to where the hawk activity had been. She had been ignoring the continual stream of dogs and walkers passing by for the previous couple of hours, looking up only now and then from her own activity — they all had passed through calmly and uneventfully. But when the hyperactivity began, and the dog’s quick movements were in her direction and away from the owner, the coyote’s instincts kicked in, and she dashed like a bullet towards the dog. As a number of people yelled at the owner to get her dog, the owner scrambled to do so and was able to leash the dog. The coyote stopped about 75 feet away, deterred by the number of people — five of them — standing by the dog. Chances are that the coyote and dog might never have made contact. But the coyote is territorial, which means she protects her hunting areas. Coyotes drive outsider, non-family coyotes out of their territories. Territories belong exclusively to the one coyote family which lives there and these territories are not shared with other coyotes. The coyote’s motivation in charging at the dog would have been to drive the dog — an obvious hunting competitor judging by its pursuit of the hawk — out. The coyote was deterred from advancing further by people. If people hadn’t been there, and if the owner had been alone with her dog, the owner’s option would have been to leash her dog and WALK AWAY immediately, thereby showing the coyote that the coyote nor the territory were “objects of interest”. This is accomplished by walking away and increasing the distance between dog and coyote. Increased distance is your friend. The event was very interesting for everyone present, but it could easily have ended with a nip to the dog’s haunches, and been a more frightening experience for the owner. On the other hand, the incident could have been entirely prevented in the first place had the dog been leashed in an area where a coyote was known to be foraging.